You fine DA Trippers might be interested in The Cruciverbalist. Looks like fun… I find it odd that newspapers are still the primary vehicle for the cryptic… could the Cruciverbalist mag be the future? So I’ve updated the theme again. This time, it’s because the previous theme was faulty: whenever it would update itself, the theme would bring back threaded replies, which I think we’ve decided is not what we want on the site. Sorry for the multiple theme updates. But I hope you like this one! How About This Xmas DA from 2011 Instead? As posted earlier, there’ll be no DA published this week, so why not this excellent themer from around Christmas 2011? No DA for Christmas this year. And there was no LR on Monday. All in all, a terrible week for cunning cruciverbalists, but hey, it’s Christmas. What’s to complain about, really? 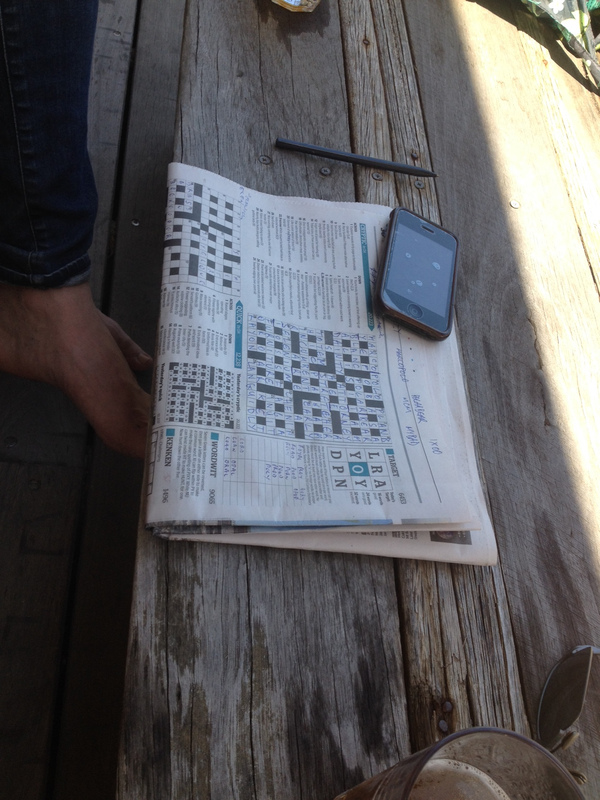 Oh, and SMH peeps: I’m informed there will be a giant-sized cryptic-rich holiday crossword coming your way on the weekend as compensation for the lack of Friday fun. 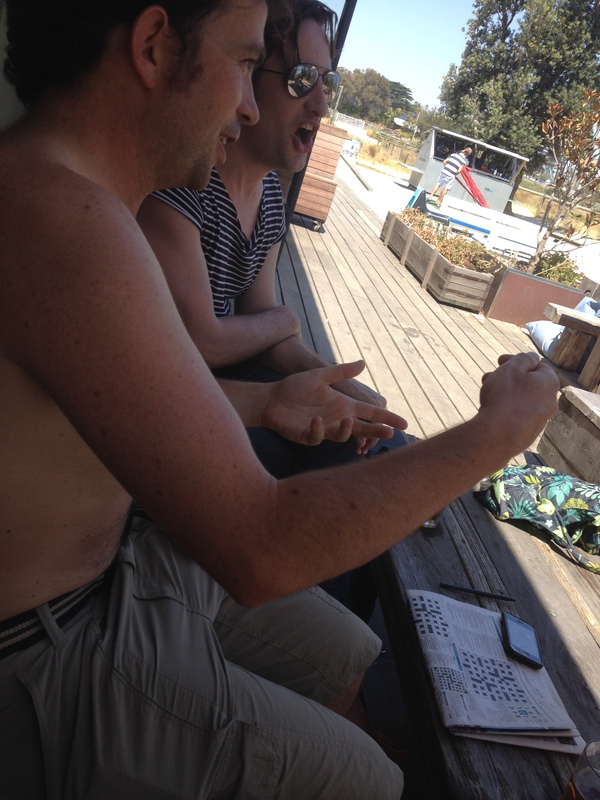 We’ve undoubtedly got some budding crossword compilers in our midst. 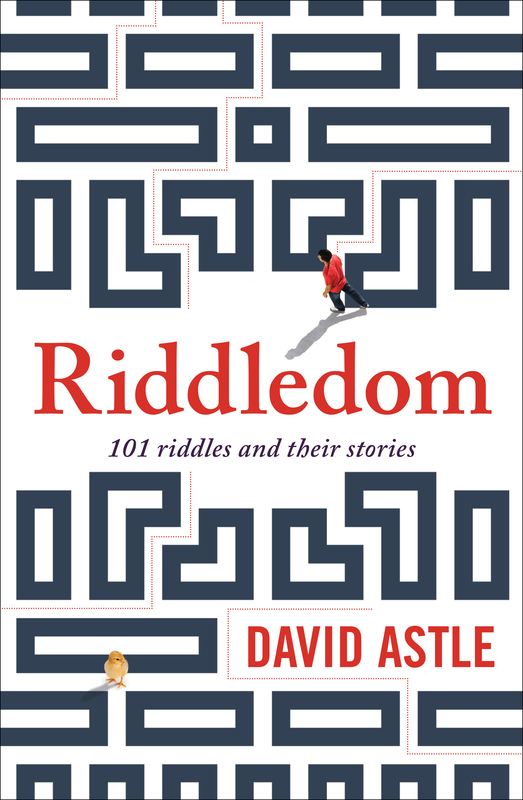 If you’ve tuned in late, I’m choosing the best of an excellent bunch of clues for Riddledom, which is the title of DA’s fun and wondrous new book on a subject dear to all our hearts, riddles. RL: The Book of David will abolish initial doubts of model in decline – so good, I love that model in decline can mean many things and reveals itself as the last five letters of riddledom, but ultimately I did not add it to the short list of contenders because will is just hanging around. If will was to, the clue would have probably made the short list. Kerry: Enigma champagne – I like the combination of champagne and enigma, but probably needed little more something to combine the two concepts more elegantly. DA Nut: DA’s book to fiddle more, diddle less – almost, so almost. 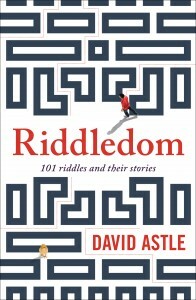 Just thought less wasn’t quite enough to signify drop the last letter on diddle and have that be the anagram’s fodder. V&A: Spooner swindles short affair for DA’s tale – so close, but swindles becomes diddles, which means there’s an extra s marring this otherwise excellent clue. Bernie: Damaged home contents: David’s latest concern – very elegant surface reading, very understated, great misdirection with a potential anagram indicator being a straight synonym. Classy. 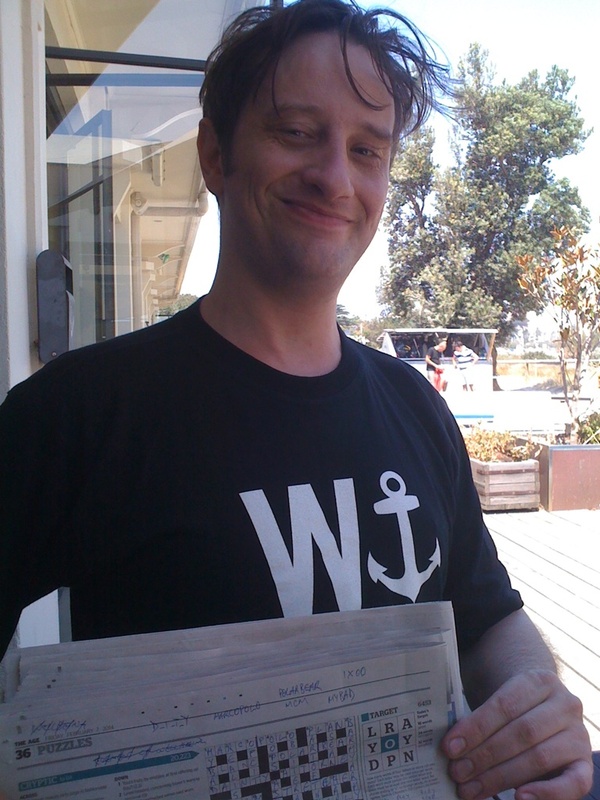 Bondles: Astle’s work in large brassiere held by muddy whip-wielder – excellent job playing to my preference for a little blue in a cryptic clue, and had me learning a new meaning for the word rile. Tom: “Holey Mantra,” David’s writing – I liked thinking of riddledom as riddled om. I think that’s also a great title for a book about a drugged-up hippie. Ray: Book bore Portuguese title – so ridiculously elegant with excellent misdirections on Portuguese title and on bore. Helen Ryan: Q & A for Spooner’s trick of memory – it’s an elegant Spoonerism with a verb/noun misdirection — what more could one want? Bondles, Ray and Helen Ryan, shoot through an email with your address details so a copy of DA’s book can be posted to you. In the right-hand column of this website is the email address to send your details to. I had no idea actor means TREE. Has anyone seen this in an Australian cryptic? Interesting article. 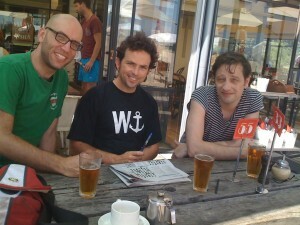 It has been a long three years since the original DA Trippers, RC, TH and I (AS), were together again in the same city. 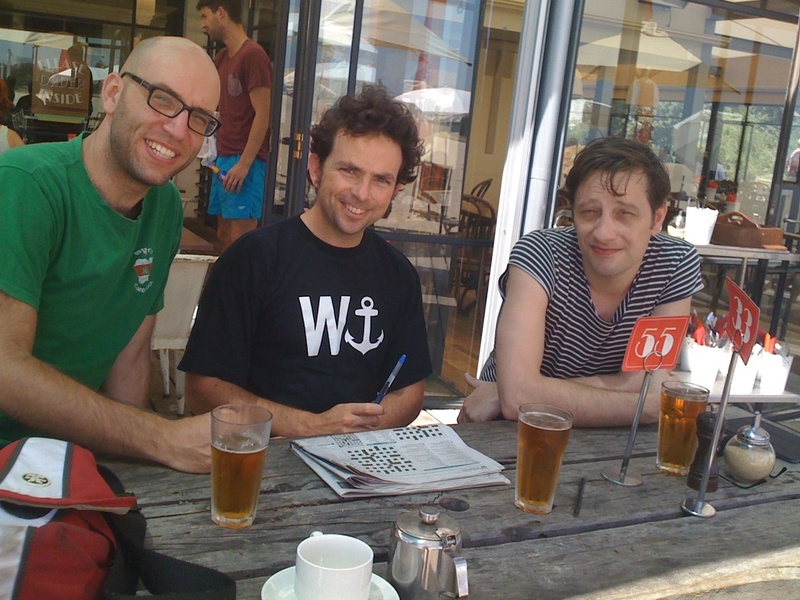 As has become the tradition when we three reunite, we battle it out over a DA to decide who is the worthy wearer of the Wanchor, the honorary threads awarded to the day’s finest solver. I have to deal with spam, which is usually handled by a spam filter nicely. Unfortunately, I still have to deal with the traffic caused by the spam bots coming in and making comments, and I’m very close to my monthly bandwidth limit on the service I pay for to host this site. So, as a temporary measure to drop spam traffic, I’m making commenting available only to those who log in via a WordPress account registered to this site. I plan to keep this in place over the next few days and turn it off before Friday when the new DA comes out. This will drop the spam traffic significantly because spam bots won’t be able to log in, and so we don’t hit the monthly bandwidth limit. Sorry for the inconvenience, but it should all be back to normal by Friday. As for the account, both the username and password is datripper. Log in with that and then state your name to make a comment. 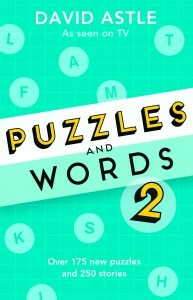 I figure that many of you would be interested in knowing that, back by popular demand, is a second helping of DA’s word puzzles and word stories, just in time for Christmas. 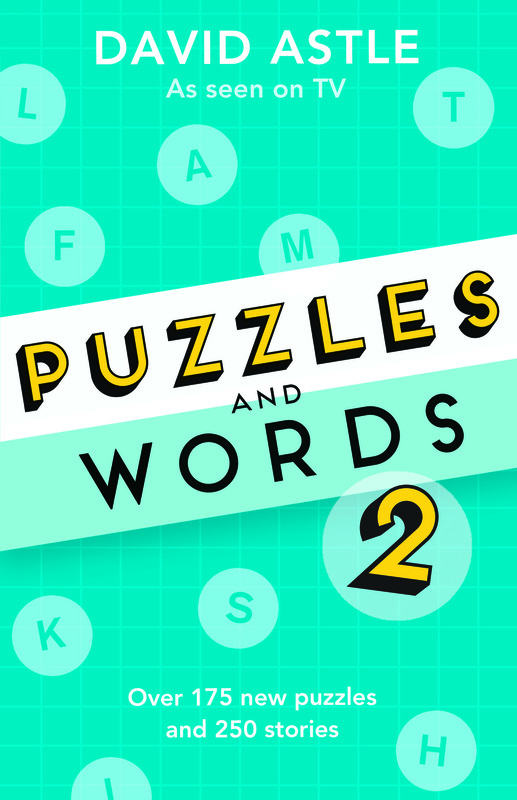 This one, Puzzles and Words 2, is just as much fun as the last. My highlight: learning that an aubade, in contrast to a serenade of an evening, is a morning love song. Where else are you going to find out stuff like that? More information is available about the book at Allen & Unwin’s website.